Three new research articles show that the conditions for life as we know it here on Earth exist in the Universe. 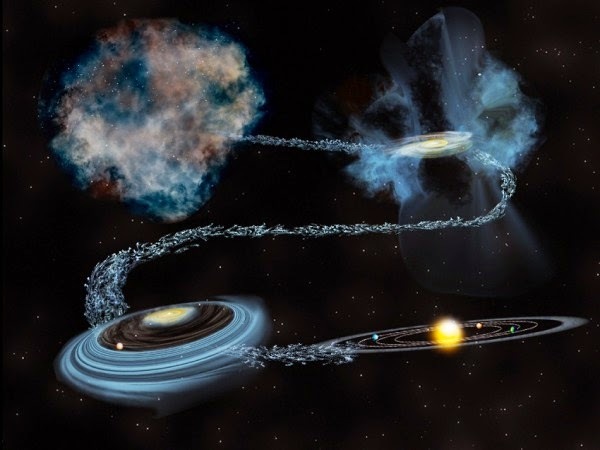 Research has shown that water is a byproduct of stellar formation. A significant portion of the water here on Earth has been found to predate the formation of our Sun. We know how old the Sun is and the study shows that a lot of the water here on Earth is older which means that it had to come from the giant gas cloud that our Sun formed from. We can extrapolate this to other stars and planets that form in the same manner as ours and rightfully conclude that water must be present in those star-exoplanet systems as well. There is some thought that much of the planet's water came from the impact of asteroids and comets. Each of these left overs from the formation of the solar system were formed from the same gas cloud that made the Sun and the Solar System. Astronomers have also found a new complex organic molecule in a gas cloud in our Milky Way Galaxy. This discovery shows that even more complex molecules are awaiting discovery and can form in interstellar space. It is thought that the molecules necessary for life here on Earth could have been deposited billions of years ago by cometary, asteroid and meteorite impacts. The last article comes from our very own University of Maryland which has discovered water vapor in the atmosphere of an exoplanet 124 light years away in Cygnus, the Swan. I have no doubt that life exists in the Universe beyond Earth and is plentiful. Obtaining proof however, will be difficult. Life may be found in our own solar system on Mars or on some of the moons that have oceans; robotic spacecraft will be key to such explorations. We may someday finally encounter a radio signal that clearly has but one possible origin - intelligent life. One thing we KNOW for certain is this - the formation of stars produces planets - lots of them. You cannot have life as we know without a stable source of energy produced by a star that falls upon the surface of a planet. We have confirmed almost 4,000 planets beyond our solar system and have calculated that each star in our galaxy has an average of 10 planets. 200 billion+ stars equals 2 trillion planets in our galaxy alone and their are 100's of billion of galaxies in the observable Universe. Life always finds a way on Earth even after great dyings/extinctions and I have no reason to doubt life is any different in the Universe. Food for thought when you look at the stars Space Placers. I'll be up at Shenandoah National Park tonight at 9 pm EDT giving another presentation. Hope/Wish you can/could be there. November 12, 2014. Mark your calendars to tune in that date for watching space history made as the European Space Agency's (ESA) Rosetta spacecraft launches its Philae lander. The intrepid lander will attempt a landing on Comet 67/P at 'Site J' which I blogged about previously. This will be a tricky attempt that if successful will give a great view and data on the comet as it approaches the Sun and begins to sublimate or evaporate its surface and volatiles into space. Rosetta will continue to orbit 67/P during this time. I'll have more as we get closer. A new crew to the International Space Station (ISS) , Expedition 41, launched safely today. They have LOTS to do in the way of scientific research which is good for all of us here in Terra Firma. It's not everyday you can have a live ringside seat to a spacecraft entering robot around another planet. Tune in tonight, 9/21/14, at 9:30 p.m. EDT on the Internet to follow live coverage of NASA's MAVEN (Mars Atmosphere and Volatile Evolution) spacecraft entering orbit around Mars. Of course there is a time lag in the distance between Earth and Mars and the feedback to Mission Control will be shared live as it happens. The spacecraft will be on its own to perform all of the necessary actions to slow down and be captured by the gravity well of the Red Planet. 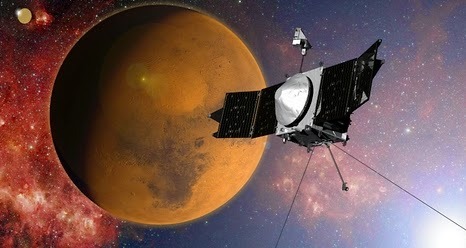 MAVEN will orbit Mars to learn about the atmosphere of the Red Planet and how it has evolved. It also hopes to answer questions about how the loss of volatiles in martian atmosphere has modified the planet. MAVEN was launched on November 18, 2013 and is expected to explore Mars for at least one year. Here is another discovery about galaxies and their formation. The new research shows how galaxies like our own Milky Way Galaxy, a spiral/disk galaxy can merge with another galaxy and produce a disk galaxy in the process. Previously astronomers thought that such mergers would lead to the formation of an elliptical galaxy - that is one without spiral arms. Astronomers have just announced the discovery of a SUPERMASSIVE black hole (SMBH) that is FIVE times larger than our own Milky Way Galaxy's (MWG) SMBH in a dwarf galaxy 1/500th the size of the MWG. That is impressive. 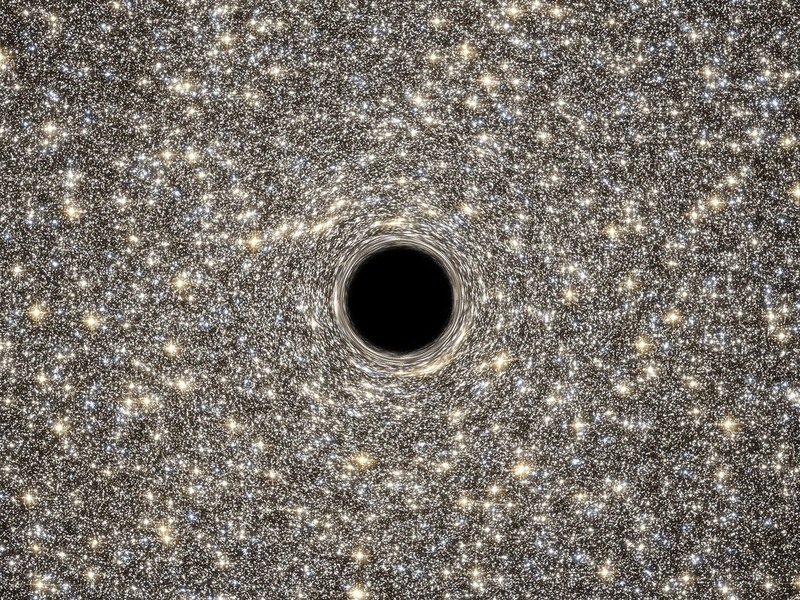 Astronomers are pretty sure that supermassive black holes (SMBH) reside at the center of larger galaxies like the MWG. Some of these SMBHs are millions or even billions of times the mass of our Sun. It is not known which comes first, the SMBH or the galaxy but it is pretty certain that the two are connected to the lives and evolution of galaxies. But to discover a SMBH this large in such a small dwarf galaxy only 300 light years across is a major find. The SMBH in M-60 UCD-1 makes up 15% of the dwarf galaxy's mass; there are an estimated 140 million stars in the galaxy. This discovery will help in the search for more SMBHs in the cores of other dwarf galaxies and may lead to an important understanding of galaxy formation and evolution.. The waning crescent Moon and bright Jupiter will be visible near one another for the next few days - 9-19 to 9-20 - in the east before dawn. The two will form a pretty pair easily visible to city and suburban dwellers alike. The motion of the Moon relative to Jupiter will be obvious over the two days and Earthshine should be present on the Moon. Earthshine is the dark portion of the Moon that is visible due to the reflection of sunlight off of our planet's clouds and oceans. This phenomena was explained by none other than Leonardo da Vinci. 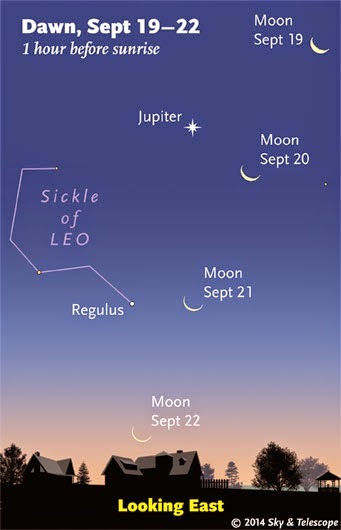 If viewers have binoculars they can see the four main moons of Jupiter as small "stars" just as Galileo did when he discovered them with his crude telescope. Binoculars will also enhance the view of the Moon and Earthshine. Let's hope it is clear! Sky Guy Internet ALERT 7:30 PM, EDT, 9-1-8-14, Debate on "What Is A Planet?" Still mad about Pluto's demotion to minor planet status? Want to learn more about the whole "what is a planet" debate? Tonight at 7:30 p.m. EDT is you chance as the HARVARD-SMITHSONIAN CENTER FOR ASTROPHYSICS (CfA) hosts an Internet debate. In 2006, when the International Astronomical Union (IAU) voted on the definition of a “planet” and booted Pluto out of the club, confusion resulted. Was a “dwarf planet” a small planet or something else? Was a “dwarf fruit tree” a small tree or something else? Almost eight years later, most astronomers and the public are still as uncertain about what a planet is as they were back then. On September 18th, three different experts in planetary science will present each of their cases as to what a planet is or isn’t. Science historian Dr. Owen Gingerich, who chaired the IAU planet definition committee, will present the historical viewpoint. Dr. Gareth Williams, associate director of the Minor Planet Center, will present the IAU’s viewpoint. And Dr. Dimitar Sasselov, director of the Harvard Origins of Life Initiative, will present the exoplanet scientist’s viewpoint. After these experts have made their best case, the audience will get to vote as to what a planet is or isn’t and whether Pluto is in or out. And just like the IAU, you have to be present to cast your ballot! The results will be announced on Friday, September 19th. The talk will also be archived on the Observatory Nights YouTube channel immediately following the event. I look forward to seeing the voting results. How Many Stars Can We See With Our Eyes? Ever looked up at the night sky and wondered how many stars you could see? Here is a GREAT article that tells you the answer. And remember, astronomers think there are about 10 planets on average orbiting each star! NASA has announced it has selected Boeing and Space-X for the Commercial Crew Transportation Program. This is a very important date in American spaceflight history as it sets America on the path to having its own access to space since 2011. The first manned flight for both companies is scheduled for 2017. Tune in today, 9-16-14 at 4 pm EDT to hear who NASA will select as the winner of NASA's Commercial Crew Transportation Program. This will be interesting to watch live from Kennedy Space Center, Florida as NASA Administrator Charles Bolden and his senior leaders make the announcement. This is a MAJOR announcement as it will decide between Boeing, Sierra Nevada or Space-X, or a combination of these three, as to who will win the contract to deliver U.S. astronauts to the International Space Station (ISS). The selection will allow the winner(s) to go full speed on developing their manned spacecraft for the transportation of U.S. astronauts to Low Earth Orbit (LEO) and ISS. This is a capability the U.S. has not had since the Space Shuttle program ended in 2011. The U.S. (and the other ISS partners) have had to rely on and pay Russia for seats on the Soyuz spacecraft. The U.S. has been paying about $71 MILLION a seat and tensions over the Ukraine has strained U.S.-Russian ties. There has been no real affect on the operation of the ISS as a result although Russia has indicated it will cease ISS participation sooner than the U.S. desires. Sierra Nevada has chosen a spaceplane, the Dream Chaser for its design. You can learn more about the CCP here. I personally think that NASA will not put all of its manned access to LEO and ISS in just one basket, especially with this being a COMMERCIAL and not government program like Orion/SLS are. It makes sense to have two private companies available in case one goes under and/or has an accident which would ground U.S. astronauts again. We saw this happen with the Challenger and Columbia accidents and cancellation of the program altogether. NASA cannot afford such a repeat again. The U.S. has to have its own manned access to LEO/ISS AND the ability to go deep into space which NASA's Orion/SLS will give us. Watch this and get goose bumps like I did….. The cross marks the spot for Rosetta's Philae Lander - or Site J as ESA calls it (See yesterday's blog). 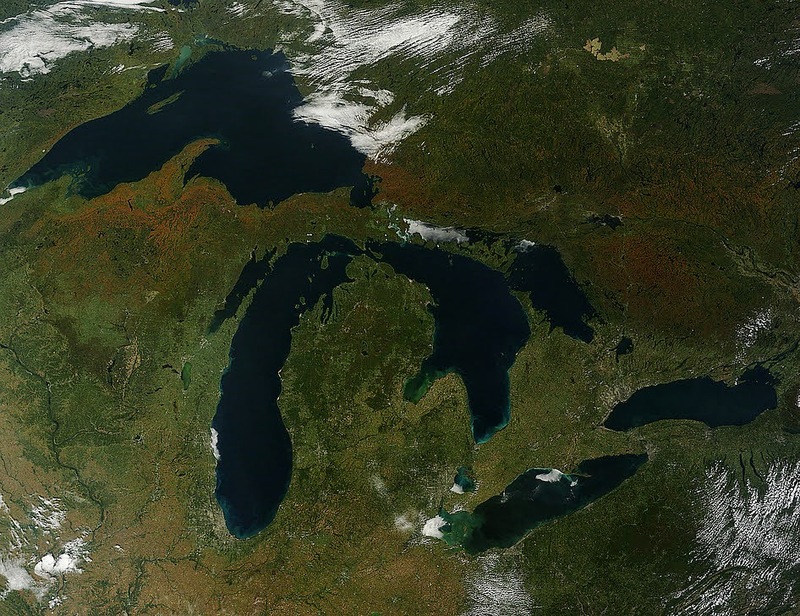 This was one of five sites selected from a larger list that ESA had compiled and studied. ESA has just announced its selection of the landing site and it will be a combination of safe landing probabilities and high science return for Philae. The landing will take place in November 2014. The European Space Agency (ESA) will announce on 9-15-14 at 5 a.m. EDT where its Philae lander which is currently attached to the Rosetta spacecraft, will put down on Comet 67P/Churyumov-Gerasimenko. ESA will chose the final landing site from 5 candidate sites. The landing will take place some time in November. You can watch the announcement here. 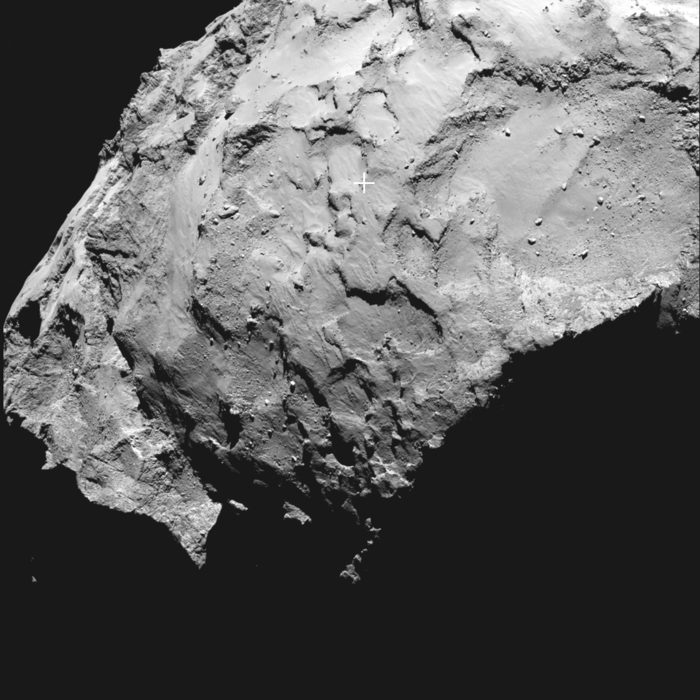 Comet 67/P has no visible ice/water patches on its surface and is darker than charcoal. A NASA instrument aboard Rosetta has made some observations of the comet that can be read about here. This is going to be a fantastic mission to follow in the year to come. WIth the Philae lander making observations from the surface and the Rosetta spacecraft orbiting the comet while it swings around the Sun we will get data that will add greatly to our knowledge of these icy leftovers from our solar system's formation. 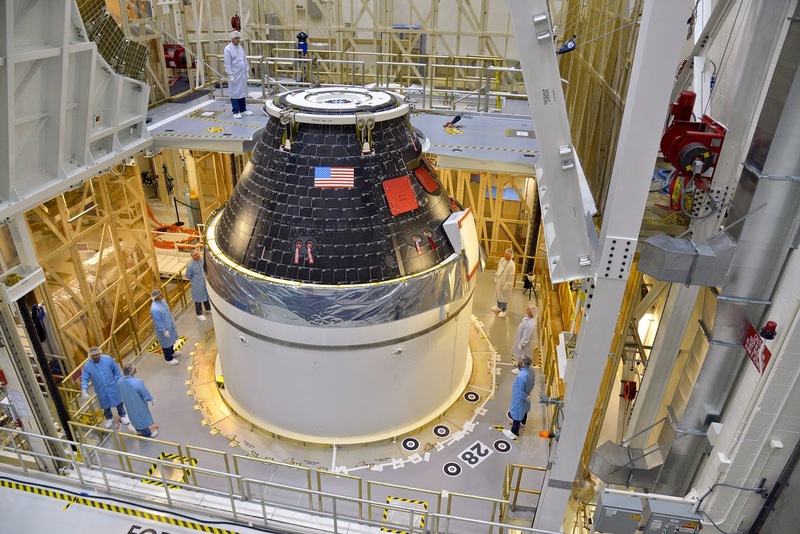 A LOT going on at NASA regarding the new manned Orion spacecraft and SLS. 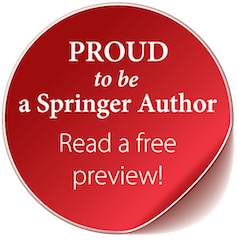 I have included the links so you can read as much as you like. Go to this link to see the full hi-res version and get more information. We are less than 90 DAYS away from the scheduled launch of Exploration FLight Test-1 (EFT-1) on December 4th. I can hardly wait. I will be at sea when the launch is scheduled but will be watching on the Internet. NASA is making steady progress towards getting back into the manned spaceflight business. The Space Launch System NASA's new rocket it is building to launch Orion and other spacecraft into deep space. 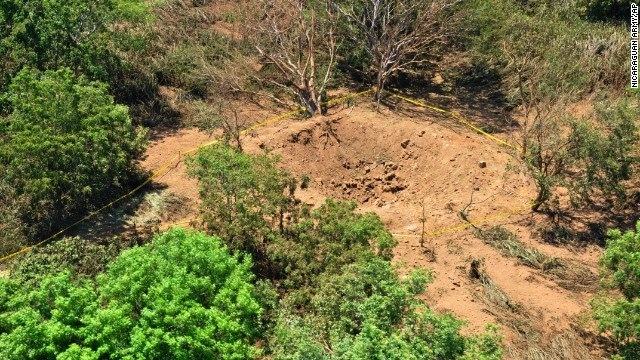 The Internet is lit up over a reported meteorite impact in Nicaragua that left a crater. IT WAS NOT. 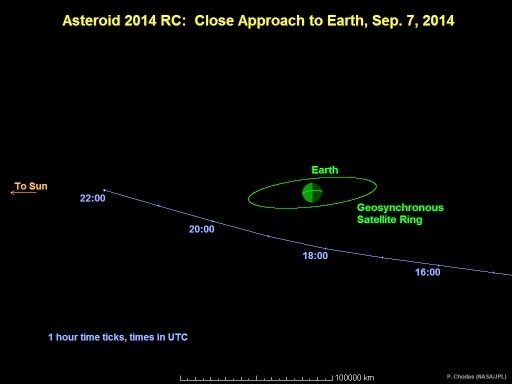 Here is the latest from NASA on 2014 RC and the alleged impact event. Meteorites should have been visible in the immediate area surrounding the crater as the energy released by this event WOULD NOT have vaporized the impactor. Bottom line is that this should NOT be characterized as a meteorite impact event until proven as such, let alone associated with asteroid 2014 RC which is absolutely incorrect. Tonight - 9/8-9/14 - is a Super Harvest Moon! LOTS going on with Luna tonight as this will be the 3rd Supermoon since July and it coincides with the Harvest Moon. Supermoon is a non-astronomical term that has become part of our cultural vocabulary. Astronomically speaking when the Full Moon occurs within 24 hours of being closest to the Earth (perigee) for the Moon's monthly orbital cycle astronomers call it a perigee Full Moon. You may not have known that each month's Full Moon has a name associated with it that stems from different cultures. In the U.S. the Full Moon names trace back to Indian tribes and our farming heritage. The Full Moon that occurs closest to the Autumnal Equinox in September is named the Harvest Moon. That is because in times past farmers could use the extra light provided by the Full Moon to bring in their crops. Because tonight is a Super Harvest Moon the Full Moon will be a little bigger and brighter as it rises in the east at sunset. As a bonus the Moon will be rising just a little later each night for the next couple of days so we can continue to enjoy its splendor. Get outside and enjoy this viewing treat. 2014 RC was discovered initially on August 31 by the Catalina Sky Survey near Tucson AZ, and independently detected the next night by the Pan-STARRS 1 telescope, located on the summit of Haleakala on Maui, Hawaii. Astronomers will study 2014 RC as it passes by to add to our knowledge of these roamers of the solar system. The orbit of the asteroid will also be refined so that it can be monitored for any future potential threat to Earth. 2014 RC will be visible to observers with telescopes in the Southern Hemisphere so we should get some pictures of this cosmic interloper. This asteroid is about the same size as the asteroid that exploded over Chelyabinsk, Russia on 2/15/13 and caused damage and injuries. Because Chelyabinsk came in from the direction of the Sun it was not seen before it entered our atmosphere. Our solar system has a lot of asteroids in it, probably millions, and we have discovered a good percentage of the larger ones but have barely scratched the surface when it comes to the Chelyabinsk-sized space rocks. Comets pose a potential threat to Earth that is even greater than asteroids because they can be larger and faster moving and thereby provide less reaction time. I personally believe we need to do more as a species about discovering these Near Earth Objects (NEOs). One thing you can consider doing is making a donation to the B612 Foundation to help fund the Sentinel spacecraft and mission. Sentinel will be a big help in looking for NEOs as it will be out by Venus and give us a different perspective in our hunt for NEOs. Sentinel will help detect incoming sunward (from Earth's view) asteroids like Chelyabinsk which could allow for evacuation of a impact zone. Here is a widget from NASA that tracks asteroid close approaches. Pretty amazing to watch this day to day as I do. You can also track Potentially Hazardous Asteroids (PHAs) daily here. Humanity is in the process of coming up with a planetary defense plan against NEOs but it will take time and money. I always tell my audiences and have them repeat it - "The dinosaurs are dead because they did not have a space program". Like B612 Foundation co-founder and former shuttle astronaut Ed Lu says, "Asteroid impacts are the only preventable natural disaster. For the cost of a freeway overpass we can mitigate this threat". Today, 9/6/14 is "International Observe the Moon Night". This annual world-wide event is dedicated to getting people outside to look at the Moon. Events around the world are taking place as part of the event and be sure to check the website to see if any are in your area. The DMV has several events taking place, especially at NASA facilities - so be sure to check. 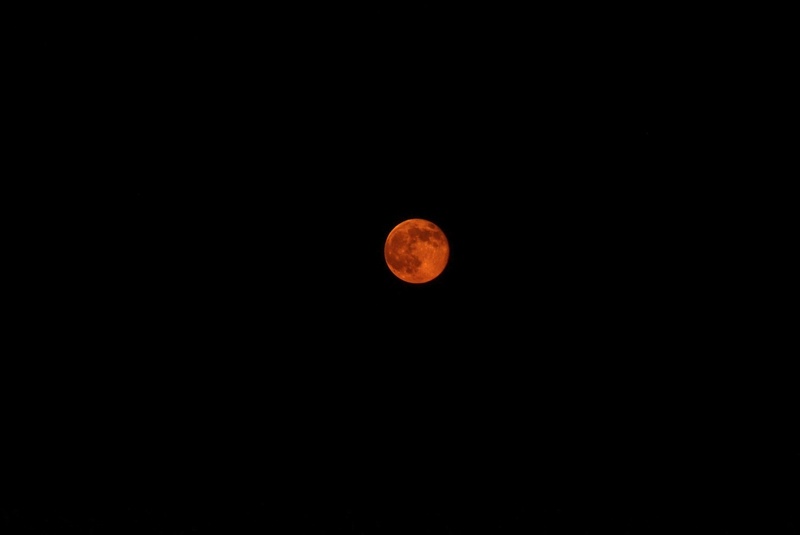 But go outside tonight and look at the Moon. We did this last night at Big Meadows Shenandoah National Park as part of my "Let's Talk About Space" program. We go out and observe the sky if it is clear after my talk, which last night was on "The Sky IS Falling-Space Rocks and You". I'd like to share with you the main points about the Moon that I gave to the 25+ people last night. The Moon is big. It would span coast to coast in the U.S. When you look at the Moon what colors do you see? White and gray. The white is the original lunar crust made up primarily of a mineral called Anorthosite. The gray marks impact basins - places where a comet or asteroid slammed into the Moon billions of years ago and was flooded by the flow of lava from fractures within the lunar crust. These impact basins are large and the South Pole-Aiken Basin is one of the largest in the solar system spanning 1,600 miles across and almost 10 miles deep! We also are pretty sure that the Moon formed due to a huge impact event involving the Earth and a Mars-size planet called Theia billions of years ago. Our planet had a ring system like Saturn's for about a million years or less while all of the debris from the impact orbited Earth. The debris eventually coalesced into possibly 2 moons which then collided to form the large Moon we have today. Our Moon was much closer to Earth after it had formed, and would have been at least 50% larger in the sky long ago. What a sight that must have been! The tides on Earth would have been amazing because of the Moon being so much closer and our planet would have rotated faster with the day being only hours long instead of our 24 hour day we enjoy. The Earth and the Moon are described by the European Space Agency as a double planet system because of their relative sizes to one another and their gravitational influences upon each other. Do a google search on the Moon and you will find many websites dedicated to our neighbor in space. Be sure to visit Lunar Reconnaissance Orbiter (LRO) and see the wonderful pics it has taken. NASA Goddard in Maryland is hosting an LRO event tonight. Oh, and be sure to wink at the Moon tonight in remembrance of Neil Armstrong, the first man to walk on the Moon. Neil has been gone for 2 years now and his family wanted people to do this in memory of him. Finally, watch this video in the quiet of the night after you have looked at the Moon - its ALWAYS brings tears to my eyes because it is so beautiful. The NASA Jet Propulsion Laboratory Solar System Ambassadors Program (SSA), a nationwide network of space enthusiast volunteers, will accept applications from September 1 through September 30, 2014. Highly motivated individuals will be given the opportunity to represent NASA's Jet Propulsion Laboratory as volunteer Solar System Ambassadors to the public for a one-year, renewable term beginning January 1, 2015. While applications will be sought nationwide, interested parties from the following states are especially encouraged to apply: Alaska, Delaware, Iowa, Mississippi, Nebraska, North Dakota, Oklahoma, Rhode Island, Wyoming and the District of Columbia. SSA hopes to add 100 new volunteers to the program in 2015. To learn more about the Solar System Ambassador Program, visit http://www2.jpl.nasa.gov/ambassador/. Links to the Announcement of Opportunity and Application form are available on the website’s main page. Called the Origins-Spectral Interpretation-Resource Identification-Security-Regolith Explorer (OSIRIS-REx), the spacecraft will rendezvous with the asteroid Bennu in 2019, collect a sample and return the cache in a capsule to Earth in 2023 for detailed study. The robotic mission will spend more than two years at the 1,760-foot (500-meter)-wide asteroid and return a minimum of 2 ounces (60 grams) of its surface material. Topics for submissions by the public should be about solar system exploration in 2014 and predictions for space exploration activities in 2023. The mission team will choose 50 tweets and 50 images to be placed in the capsule. Messages can be submitted Sept. 2 - 30. "Our progress in space exploration has been nothing short of amazing," says Dante Lauretta, OSIRIS-REx principal investigator at the University of Arizona, Tucson. "I look forward to the public taking their best guess at what the next 10 years holds and then comparing their predictions with actual missions in development in 2023." "It is exciting to think that some people may formulate predictions then have the chance to help make their prediction a reality over the next decade," said Jason Dworkin, OSIRIS-REx project scientist at NASA's Goddard Space Flight Center in Greenbelt, Maryland. "OSIRIS-REx has to take many years to perform a complex asteroid sample return," said Bruce Betts, the director of science and technology at The Planetary Society in Pasadena, California, a public outreach partner on the asteroid mission. "A time capsule capitalizes on the long duration of the mission to engage the public in thinking about space exploration -- where are we now, and where will we be." The OSIRIS-REx mission is focused on finding answers to basic questions about the composition of the very early solar system and the source of organic materials and water that made life possible on Earth. The mission also will contribute to NASA’s Asteroid Redirect Mission (ARM) and support the agency's efforts to understand the population of potentially hazardous near-Earth objects and characterize those suitable for future asteroid exploration missions. NASA's ARM is a first-ever mission to identify, capture and redirect a near-Earth asteroid to a stable orbit around the moon, where astronauts will explore it in the 2020s, and return with samples. The mission will advance the new technologies and spaceflight experience needed for humans to explore Mars in the 2030s. NASA's Goddard Space Flight Center will provide overall mission management, systems engineering and safety and mission assurance. The University of Arizona, Tucson, is the principal investigator institution. Lockheed Martin Space Systems of Denver will build the spacecraft. OSIRIS-REx is the third mission in NASA's New Frontiers Program. NASA's Marshall Space Flight Center in Huntsville, Alabama, manages New Frontiers for NASA's Science Mission Directorate in Washington. I hope you will enter AND send a message to Bennu. You really have to read this press release, see the graphics and watch the video regarding our newly identified galactic supercluster - Laniakea, which means "immense heavens" in Hawaiian. We live in the Milky Way Galaxy (MWG). It is part of a local cluster of galaxies called the Local Group. The Local Group is connected to Laniakea which comprises 100,000 galaxies spread out over 500 million light years and containing the mass of over 100 million billion Suns! Wow. Astronomers continue to define the Universe and our place in it with new instruments, detectors and more powerful computers. But great mysteries remain such as Dark Energy and Dark Matter. 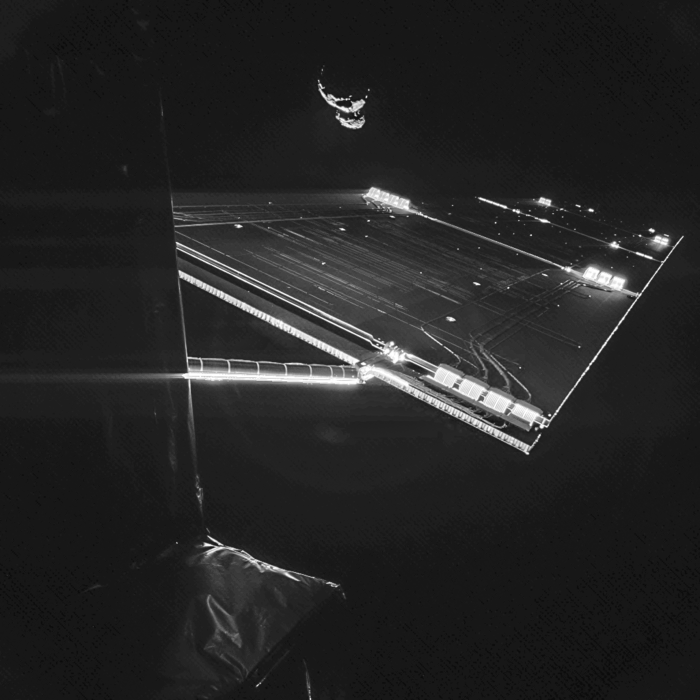 Where Will Rosetta's Philae Land? The European Space Agency (ESA) is deciding where Philae, the lander carried by the Rosetta spacecraft, will land on Comet 67/P. ESA had narrowed the field down to 5 landing sites on the comet and today held a live session that you can see here. ESA plans to land Philae on 67/P sometime in November 2014. Labels: Where Will Rosetta's Philae Land?